Published in CISA’s April 2019 E-Newsletter – Sign Up Here! The dining room of The Bement School is unlike any dining hall I’ve ever seen—or smelled, for that matter. My first clue that Bement does things differently was the aroma of roasting meat and vegetables that smelled more like Sunday dinner at grandma’s than typical dining hall fare. The space is carefully crafted to reflect this homey feel. 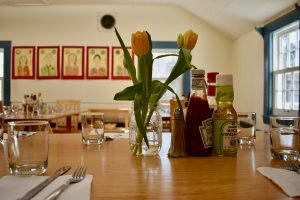 The two dining rooms of this historic building on the Deerfield campus are furnished with wooden tables that invite you to sit down as if you were in your own kitchen. Each table seats a small group of ten, adding to the cozy feel of the space. These thoughtful touches are present even in the finishing details: bouquets of tulips from LaSalle Florists that adorn each table and signal spring. This space reflects the philosophy of family and community that guides the kitchen at Bement. Kitchen Manager Jess Maenzo-Tanner grew up in family restaurants. She now provides daily meals to some 225 students and 50 staff, including her daughter who is a student at the school. 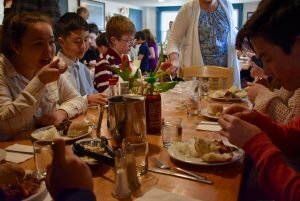 Meals are served ‘”family style”, meaning that each table of eight or nine students and one adult receives a large portion of the day’s specialties, which are then shared amongst them. All students, even the pickiest, are encouraged to take a “tasting portion”—although I don’t think many would balk at this food. 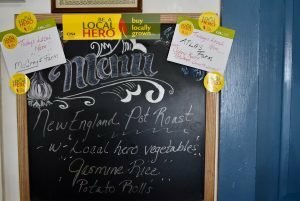 As children began to line up outside the door, some peered inside at the chalkboard featuring the day’s menu and local producers, which was proudly exhibited across from the entrance. The student closest to the door read the menu aloud and was met by exclamations of “yes!” from those around her. In addition to the popular salad bar, many students helped themselves to the daily special: New England pot roast with local potatoes, celery root, carrots, and onions from Atlas Farm. This commitment to quality local food is a key element of Bement’s guiding principles. Jess began running off just a few items from the long list of local products that they use: Kitchen Garden Sriracha, vegetables from Atlas Farm, Diemand Farm eggs, and McCray’s milk—which she said the students absolutely love. Jess, who joined Bement this past year, maintains the practice of buying local and isn’t discouraged by the winter months. “Even in the cold weather,” she argued, “there’s still an abundance of local items to be used.” Jess said that she always has plenty of tabs open to CISA’s online guide, which she uses regularly to find local producers. She continued by explaining that there are “little ways to go about [eating local]” and gave the mouth-watering example of homemade soup with miso and local kale. In addition to embracing winter produce, Jess plans to push Bement’s use of local food even further. This summer, Jess and the five other kitchen staff will be taking up the task of preserving the season’s bounty—something normally off limits to an educational institution that is closed during the summer months. Jess says that this means “being creative to think of how we can continue to [eat local] year-round, even when those things aren’t available.” For Bement, this means bringing in local berries and corn during peak season to prep and freeze for use during the school year. This commitment to local food ensures the quality and freshness of what comes out of Bement’s kitchen, but it also teaches students the importance of what they eat and where their food comes from. Sometimes this learning comes in the form of food-based lessons. 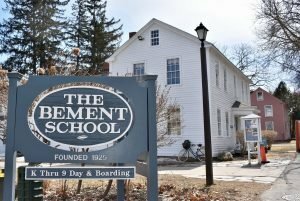 At Bement, the kitchen is an open resource, where teachers bring students to make pizzas for a lesson about self-sustainability, or where kindergarteners come to make maple waffles as part of their unit on the region’s maple syrup tradition. Beyond these food-based activities, Jess says that even the daily meal can act as “a learning lesson” that places food in the cycle of life. Yesterday, this lesson was about the ethical choices linked to eating meat, as the young students wanted to learn what exactly was the veal in their veal Parmesan. For these same curious students, local farms that supply the kitchen are presented on multiple signs throughout the dining space, which act as a constant reminder to consider where their food comes from. For Jess, this is about kids being agents of what they eat, and education is the first step.